Unending views of snow clad peaks greeted us right from the start of the ride. Some 25 km into the ride, we reached a check post where the vehicle details were entered and from there on the roads were deserted with our bike the only vehicle on the road. There is absolutely no signage to this wonderland with several deviations that lead to nearby villages and absolutely deserted streets posed us a big challenge. For kilometers, we were not able to find any settlement or locals to ask directions and we had to rely on guess work. A very interesting encounter was when we saw a local woman collecting firewood just a little off the road. We were glad to have seen her as we could confirm if we were heading in the right direction. She was curiously looking at us and we stopped our bike to check with her but to our surprise the minute we stopped our bike she took a sprint. It looked as if she was running for her dear life from us, occasionally turning around to see if we were in pursuit. It was funny, embarrassing and shocking at the same time to know that we looked that scary. This made us realize how less of outside human interaction the locals have. Half way into the ride, the road condition deteriorated and it turned to be one of the most treacherous roads that we have been on. It was an adventure riding on steep narrow slopes with absolutely no tarmac and to add on to the excitement, many water streams running across the non existent road were a delight to cross over. It was like riding on a dry riverbed with many muddy patches that would sway our bike. The brilliant and stunning landscapes and the Suru river made us feel like we were in our own fantasy land and the remoteness of this place made us experience it's virgin beauty. 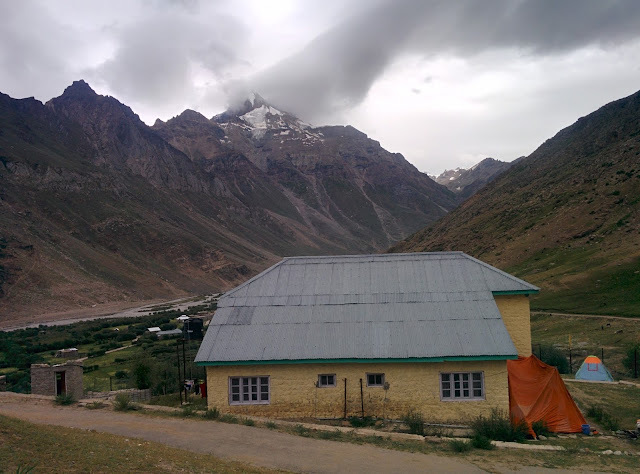 The long dusty and gravel roads led us to Parkachik which is the base to Parkachik glacier. The weather had in no time changed to gloomy and with that it started to rain a little. We decided to call it a day and we made the gorgeous J&K tourist bungalow, a little away from the Parkachik Village, our home for the night. The bungalow offers stunning views of the glaciers, mammoth mountains and the thundering Suru river that originates from the colossal Drang Drung glacier which was right behind us. It had super spacious clean rooms with attached bath and was priced at Rs.400 per night. Who says traveling is expensive. It was such a luxury to be surrounded by such amazing natural beauty and have local food. We had just walked in and were not sure if anything would be available for us to have lunch but we were lucky. They already had guests, a French couple who were cycling to Zanskar, and thanks to them lunch was ready. We were treated to a heavy yet simple lunch of dal, aloo curry and rice with very spicy local red chilli powder that was very fiery. 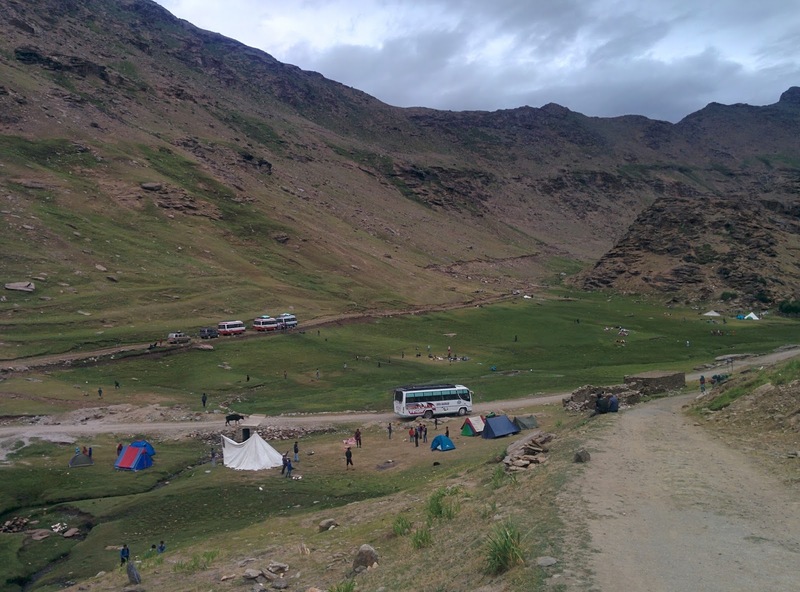 The lovely green meadows of Parkachik seemed to be the most sought after picnic spot for the locals. We saw a lot of school children pitch tents in the open under the deep blue sky, bring their own groceries and cook like one big happy family. The most amazing part was all these were government schools. It was commendable that the management has taken such awesome initiatives to provide a lifetime memorable experience to the children. They were generous and offered us amazing butter tea and it was just perfect for the cold weather. We made some great young friends and discussed a lot about the current political situation, their views and vision about future. In the evening, we went for a long walk and had quiet interesting encounters with the locals who were curious and friendly and wanted to get their pictures clicked and they had a joyous moment seeing the clicked pictures. During our leisure village walk, we saw a Yak, a wild horse a cute little marmot and it was such an amazing experience. It was time to head back and we saw most of the school buses pack things and leave. There was just one school that had decided to spend the night camping at the tourist bungalow. The young girls who had come camping were so excited to spend two good days with their friends. Most of them were in high school but very innocent and naive. They seemed to be happy and contented in their own world and had great knowledge about the entertainment industry. Though curious, they were not well versed with the general scenario of their state or political situation. It was their innocence and also questions around we not having kids despite being married for close to 5 years that threw light on how they are trained to believe that home and family is what their world should revolve around. Talking to them made us realize that how important they thought it was to have a boy child in the house and also how love marriage is still considered a taboo for them and eloping is the only way out. Though shy at first, they opened up and spoke about their likes and preferences. The other beautiful thing about these kids were they were totally cut off from technology. They had no smartphones and they reminded us of our childhood with board games, outdoor games being the source of entertainment. We relived our childhood through them. The service in the tourist bungalow was just amazing and it gave us a feel of a home stay. The friendly hosts had gone to the village to get fresh spinach for dinner. A fantastic dinner of flavored dal and rice was served with spinach. Lunch and dinner was charged at Rs.100 and 130 respectively. 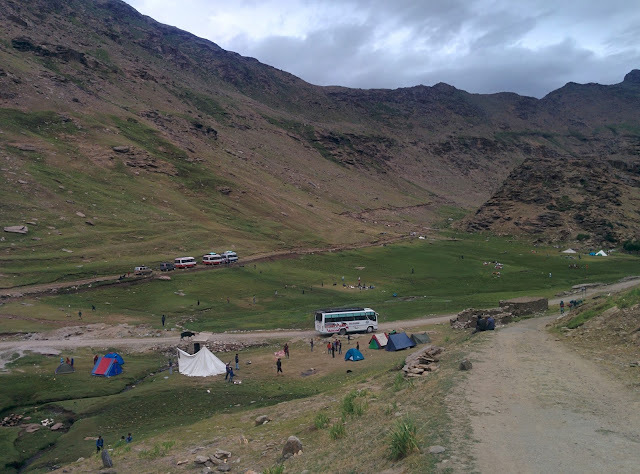 Considering the fact that it is such a remote place and we were at their mercy for food with most of their pulses, cereals and vegetables transported from Kargil, we found the food to be pretty inexpensive. After dinner, we were served a pot full of black tea to keep us warm. Language was not a barrier at all. We all managed to communicate pretty well - we, the French couple and the staff taking care of us. It was a great experience to share travel stories and listen to the advise of experts- the locals. The mercury level plummets post sunset in Parkachik. It was extremely cold despite wearing thick woolen socks, thermals, clothing, gloves and skull cap. Post midnight, it got even worse and unbearably cold. We wondered how the locals managed during winters in this inhospitable climate and with this literal bone chilling experience our ride to Zanskar valley came to a halt. We decided there is no point in not enjoying and visiting places just to tick them off our bucket list even if it is just 30 km away from were we are. Sense has to prevail and we should know when to call it quits. With a very contented heart, we had out breakfast and decided to head back to Mulbekh. En route from Parkachik, the weather gods were very kind to us. It was a very clear sky and we had scintillating views of snowy peaks and glaciers. We were very fortunate to spot a massive sheet of ice right on top of the river. The road from Kargil to sankhoo provides amazing views of Suru river and it awesome to see small green patches of island in middle of the river and water gushing down from both sides of the island. While visiting Parkachik or Zanskar valley, it would be a good idea to stock up snacks as there are absolutely no shopping options. Interesting thing was throughout the day, there was no electricity, however, post sunset it was turned back on. True Aravind, it is a must visit. Thanks Indrani, Nature is mesmerizing. Wow! What a journey! I love staying at these very local places where they make a meal only for you... and Imagibe that, in this landscape! I want to go! Ha ha ha! Yeah that is one of a kind kickass experience. Plan a trip to this beautiful destination and let us know if you need any help with planning. Thanks a bunch for such kind words :) Happy Traveling.